A participant in the German H1N1 vaccine trials reports serious adverse reactions, including coughing up blood, but the lead researcher blows it off. Yet another story of problems in vaccine safety studies that is being ignored. Why test a vaccine exactly, if you already have decided what the outcomes can or cannot be? Apparently the [German] doctor [Herr Doktor] will only accept ‘redness and swelling at the injection site’ as a side effect. The article does not say which version of the vaccine he got. Munich – A harmless prick – and thereby possibly save thousands of people. This is what several hundreds of volunteers thought, who each collected a payment of 250 Euro for their participation in the study of the swine flu vaccine trial at the Ludwig-Maximilians-University. Was the vaccine admitted too quickly to the study? The fact is that in this composition, the vaccine has not yet been applied to humans. The Federal Health Minister Ulla Schmidt explained on Wednesday that she had felt put under pressure by the pharmaceutical industry from the beginning. Criticism is being voiced with increasing frequency. 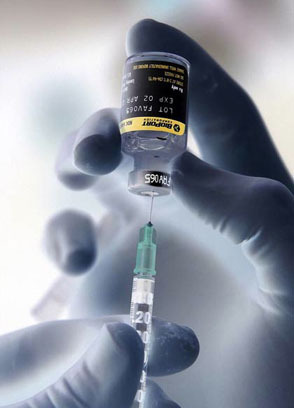 The Paul-Ehrlich-Institute points out that side-effects to this vaccine are to be more expected than in connection with a normal flu-vaccine. The Paediatric Association points to a possibly increased number of unknown side-effects. British researchers even warn about a neurological disorder known as the Guillain-Barré-Syndrome. They point to a vaccination campaign with a similar swine flu vaccine carried out in the USA in 1976, which resulted in the deaths of 25 people. Axel Sch. however insists that his complaints were a result of the vaccination. “Surely it is no coincidence that they occurred directly after the vaccination.” He criticizes the university, saying that he was not properly informed prior to the study. He said that for three days he was flat on his back during this heat. “When I phoned the LMU, they simply asked me the question needed to fill in their form and told me to see my doctor.” He now wants the medical costs and loss of earnings compensated by the medical insurance covering the trial.